There are few places in the world that celebrate Easter quite like Guatemala’s colonial city of Antigua. Over the course of the holiday, this cobblestoned town of pastel-hued houses and crumbling ruins becomes a backdrop for incense-infused religious processions, elaborate holy vigils, and exquisite street carpets made of sawdust, pine needles, and flowers. There are thousands of visitors, men in costume, women in black, and events that start as early as 4:00 a.m. It’s a bit of a brouhaha, but one you won’t want to miss. To help you make sense of the fanfare, we checked in with Viaventure’s Antigua-based guide Jane Henwood de Garcia for suggestions on when to go, what to see, and where to be. What follows is an overview of the holiday, plus some handy tips on how to have a great time. Every Sunday during Lent, as well as during the week of Semana Santa, local churches sponsor religious processions. These marches depart from a church, follow a pre-planned route through Antigua, and then return to the same church several hours later. (The municipality of Antigua distributes procession schedules and map routes in advance.) 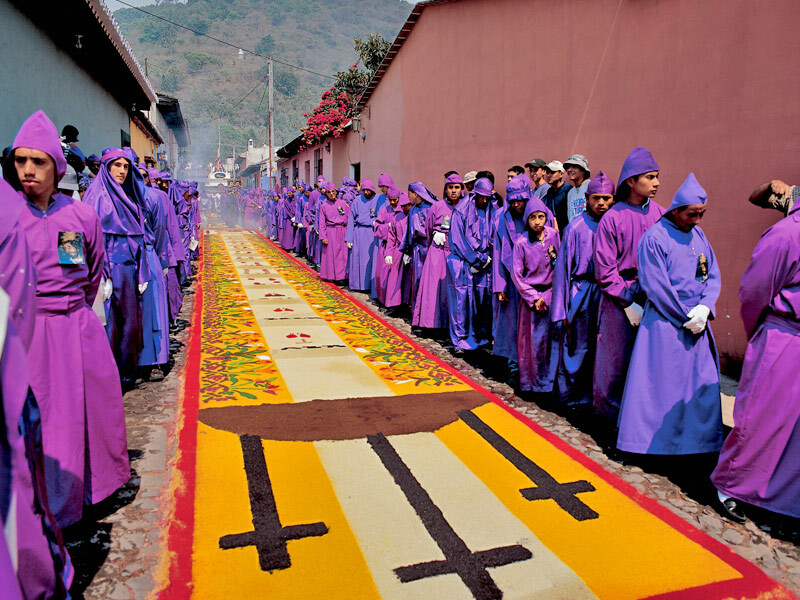 Processions comprise incense carriers, funeral bands, and costumed participants, but the andas—large wooden depictions of Jesus and Mary that are carried on the shoulders of cucuruchos (men) and cargadoras (women)—are the main attraction. Andas can weigh thousands of pounds and require myriad carriers. As such, with so many participants, processions can be very long. 5. Take a break from the solemn sights.